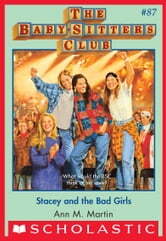 Stacey quits the club, but suddenly realizes that her new "friends" are using her as a cover for their drinking, shoplifting, and other ideas of summer fun. This just might have been my favourite bsc book ever. it was really good. if you are a fan of the bsc you will love this. i think. i really like drama and this ebook really had what i wanted in it. the beggining was a eensy bit boring but for some reason i couldnt put it down. i hope you enjoy this ebook as much as i did and i know this review is really long and thank you for reading the whole thig. i know i find long reiviews boring. i know what you are thinking. "well then why is she writng ine?" so thank you and goodbye.